Home » Warning: Have Negative Interest Rates Arrived in the U.S.? Reports have surfaced that big banks are secretly telling some of their largest clients to move their cash or face fees. Here are the changes that may be coming for all of us. Imagine if your bank were to pay you negative interest on your savings account. Maybe “paying” isn’t the right word; instead, it would actually charge you for storage of your cash, just as a vault would charge you for storage of your physical possessions, or maybe even some of your gold and silver. Of course, it makes logical sense to pay for the storage of a tangible object. What makes much less sense is why you should be charged to store money that’s almost entirely in digital form. The idea sound ludicrous, doesn’t it? Yet back in June, many were shocked to learn that the European Central Bank cut a key interest rate below zero, forcing savers to pay for the privilege of saving and becoming the first major bank to offer negative interest rates. It’s an unconventional approach that the Federal Reserve has so far avoided. Banks have been having private conversation with clients for months, says the report, telling them that since new regulations are making some free deposits unprofitable, banks will begin charging fees on those accounts. Clients whose accounts will be affected starting January 1st include insurers, large corporations, smaller banks, and hedge funds. This overturns “one of the cornerstones of banking,” because deposits have been one of the most profitable funding options for banks, according to corporate officials, analysts and bank executives who spoke to the Wall Street Journal. Here’s some Banking 101: Banks borrow low and lend high. That’s how they make money. They take your deposits and pay you one interest rate and then give loans charging higher rates. But you can withdraw your deposits at any time, and if you are an important client your withdrawal could leave your bank cash-strapped. Big, uninsured deposits, those over the FDIC limits, are viewed as high-risk and susceptible to rapid withdrawal. 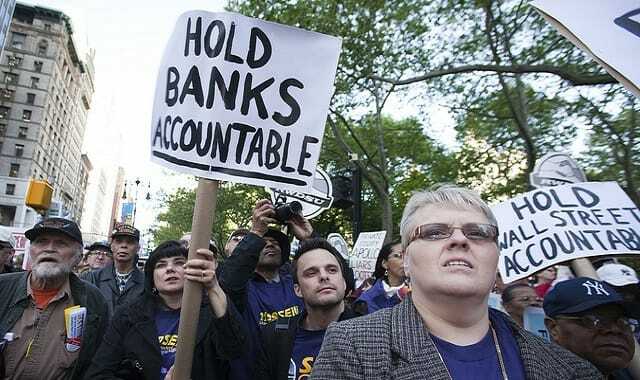 To prevent shocks similar to those that contributed to the recent financial crisis, U.S. regulators and policy makers, in accord with global banking regulators, have devised new measures requiring banks to “maintain enough high-quality assets that could be converted into cash during a crisis to cover a projected flight of deposits over 30 days.” These high quality assets the banks need to maintain cannot be used for profitable business activities such as making loans. Hundreds of bank clients holding deposits that exceed the FDIC limits could be affected, and this includes not only large corporations but also well-to-do folks. While the new measures are intended to make the financial system safer (or at least that’s how they are selling it to us), we see a number of potential problems. First, as the Wall Street Journal noted, the new policy could inflate assets considered safe such as Treasuries and quality bonds – banks will naturally start stockpiling these. Second, what if banks start to target the “smaller” accounts that most Americans have? It’s hardly a radical thought given last year’s comments by executives of America’s top five banks, in which they said they would pass on the cost on deposits if the Fed doesn’t raise interest rates. If this were indeed to happen, every saver in the U.S. from corporations to average Joe’s and Jane’s, will be squeezed to the point where they will be left with no better option than exchanging their dollars for any alternative asset, whether it be stocks, mutual funds or precious metals. Anything to get away from our baseless fiat money. If these problems eventuate, what will be the use of our fiat dollar? Not only has it been under constant assault by the Fed’s loose monetary policy, but NOW we would also have to pay for the “privilege” of keeping it in a bank? Don’t leave your savings exposed to the dollar? Even by moving just some of your savings to precious metals, you can gain some peace of mind. Call us today, or click here to get a no-cost information kit. Don’t forget that you can stay up to date on news on the dollar and precious metals throughout the week from any of our social media accounts. Did you know that we even share some of our content on our profile on SlideShare?